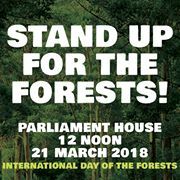 Stand up for the forests, Parliament House Perth, 12 noon, Wednesday 21 March. Join the crowd on World Forests Day to hand over a petition with an expected 10,000+ signatures asking for the government to honour its pre-election promises to move the industry out of native forests to sustainable managed plantations and farm forestry. Lismore, 11 am outside the office of MP Thomas George. Regional Forest Agreements have been a disaster and must not be renewed. The government has new logging rules in the pipeline that will massively intensify logging for wood-fired power stations here or overseas. 12 noon - rally outside the office of NSW Environment Minister Gabrielle Upton. Calling on the government to end native forest logging and establish the Great Koala National Park. Friends of Noojee's Trees. The small Gippsland town of Noojee is about to have its surrounding forests clear-felled by VicForests and sent off to the Maryvale pulpmills to be made into reflex paper. Knitting up a storm - well a tree. Contribute your knitting, crocheting and quilting to make a life-size Eucalyptus regnans. Spend Easter, March 30 - April 2, in the heart of East Gippsland's forests. Be guided by expert ecologists revealing the delicate workings of these ancient eco-systems, be awed by the diversity of a pristine rainforest and be outraged by the continuing logging destruction.